There are several choirs and opportunities for musicians too as we build a worship band for our more informal act of worship at the weekly @10.59 service. For upcoming concerts please visit the All Saints Marlow events page. To view the choir calendar and see when rehearsals take place, click here. We have recently introduced a new congregational setting for the communion service specially written for Marlow. As an aid to help learn this spirit led piece of music here is the music which everyone can read even at a very basic level and a recording made quickly one evening by the boys’ choir at a practice. Enjoy learning this new piece to uplift our worship of our church. View the song sheet by clicking here. All Saints Marlow is recognised as having one of the best traditional choirs in the area. We take pride in maintaining the tradition of boy and men choristers as well as a separate girls’ choir and an adult choir. We have at present a boys’ choir of 20 choristers and a girls’ choir of 24. Our Director of Music, Martin Seymour, is always pleased to hear from prospective choristers, scholars and parents throughout the year. To see our latest recruiting brochure, click here, or for more information about any aspect or opportunities regarding music at All Saints our Director of Music, Martin Seymour, can be contacted by email at directorofmusic@marlowanglican.org or via the Parish Office on 01628 481806. You can view this month’s music list by clicking here. Want to find out more about our choirs? Watch our video and listen to what Jeremy Rowe – counter tenor – has to say. All Saints Marlow prides itself in maintaining a choir of Men and Boys choristers as well as having a separate Girls’ Choir. The Men and Boys relish the excitement and challenge of singing choral services in a traditional robed choir whilst always looking forward to develop its part within the British choral tradition. The choir is a lively and enthusiastic group which fosters a great sense of team work and celebrates its achievements. Being a member of the choir is a commitment but there are also great rewards. As well as enhanced educational benefits such as improved concentration, boys get the opportunity to take on leadership roles, receive a first rate music education, gain the experience of singing great music in different languages as well as social time together in the crypt youth club. We recognise the busy life of choristers so we manage a flexible approach to enable a balanced commitment to family life, school work and sport. Our Director of Music, Martin Seymour, is an experienced singing teacher and choral trainer and the boys with ‘changing voices’ also receive group attention as they move into the back row to sing with the men. Rehearsals take place on Mondays after school (5.15pm to 6.15pm) and on Thursdays (6.25pm to 8.15pm) which includes some ‘crypt time’ before rehearsing with the men for the last forty-five minutes. There are also opportunities to take part in RSCM (Royal Schools of Church Music) local, regional and national events. Many of our choristers sing at the three day course at Easter in New College Oxford where they get to sing in a large group of similar aged choristers and lead the worship in some remarkable buildings full of our national heritage. 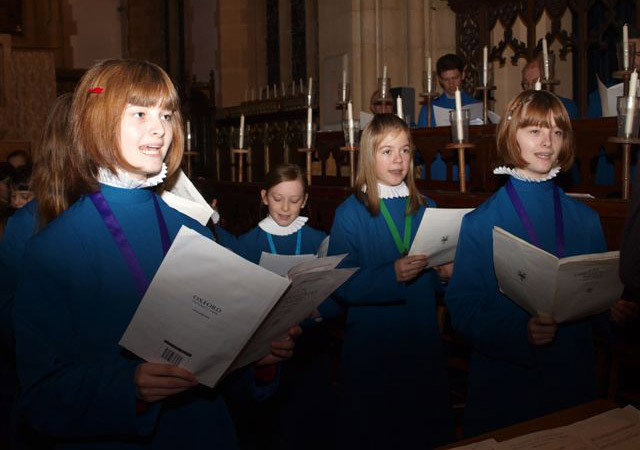 The Girls’ Choir is a vibrant group which consists of around 20 members aged 7 years through to 16 and rising. It was formed early in 2002 to work in parallel with the Boys’ Choir, but is independent and with its own identity. It is a very social group which enjoy singing to high standards. Rehearsals take place once a week on a Thursday (4.15pm to 5.15pm) with seniors carrying on until 5.40pm during school term times and in some of the holiday period when larger services can take place, for example, at Easter. The Choir sings at several services each month, both in its own right and alongside other groups including at Evensong with the Men. The RSCM ‘Voice for Life’ scheme is followed (there are currently four Bishop’s Choristers) and a number of light and dark blue award holders. The scheme gives the choristers a good fundamental music education and at the higher awards a broad liturgical understanding. It also helps to develop their concentration, confidence, personal development and experience great pieces of music in different languages. There are opportunities to take part in local, regional and national events. Many of our choristers sing at the RSCM three day course at Easter in New College Oxford where they get to sing in a large group of similar aged choristers and lead the worship in some remarkable buildings full of our national heritage. The Occasional Singers is a group of non-auditioned adults who sing occasionally throughout the month and at various special services such as Midnight Mass or Christmas morning when the Girls or Boys’ Choir are not singing. Made of mainly upper voices we sing repertoire that is appropriate to our numbers and parts but gain great satisfaction in helping to lead the singing and worship of the congregation at some of the Eucharist, Morning Worship or Evensongs. Members often take part in the annual RSCM Regional Festival in Oxford during October. If you are interested in finding out more information about the group you can contact the Director of Music, Martin Seymour, by emailing directorofmusic@marlowanglican.org or via the Parish Office on 01628 481806. View our choir calendars for dates and times, or refer to our events page for featured concerts. We welcome musicians into our growing worship band which helps to lead the music at our more informal act of worship at the weekly 10.59 service If you play an instrument to a competent standard or would love more experience do get in touch via the email below. We are blessed with a very fine three-manual ‘Father’ Willis organ, thoroughly overhauled by Mander Organs in 1997 (the company responsible also for the renovation of the ‘Father’ Willis organ in the Royal Albert Hall) and we have just had one set of bellows re-leathered by Bishop’s of Ipswich. To see the full specifications of the organ, click here. The church also has a Bechstein grand piano that is used for concerts. All Saints has good acoustics for music, whether choral or instrumental and is a popular venue for concerts from both local and national performers. We put on several series of free Friday lunchtime and Sunday afternoon concerts throughout the year lasting forty five minutes with refreshments and a retiring collection. Performers range from local talent to students from the Royal Academy of Music. Why not join our mailing list to get up to date information on the forthcoming concerts? Send an email to our Director of Music.